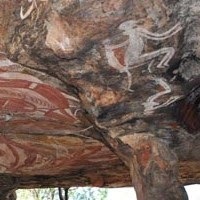 The Oldest Prehistoric Art in Australia. art ever found in Australia. The oldest Aboriginal rock art in Australia - that is, the oldest confirmed rock art - is the charcoal drawing found on a rock fragment during the excavation of Nawarla Gabarnmang, a rock shelter in Jawoyn Country, south-western Arnhem Land, in Australia's Northern Territory. Carbon dated to roughly 26,000 BCE, the drawing is the earliest art yet discovered in Australasia, or indeed anywhere within the zone of Oceanic art. The discovery was made by Professor Bryce Barker, an archeologist from the University of Southern Queensland (USQ), who was working with USQ researcher Dr Lara Lamb in the Nawarla Gabarnmang archeological site, which was first occupied by humans 45,000 years ago. Like the chambers containing the Lascaux cave paintings in France, the Gabarnmang shelter is covered with a mass of paintings of differing ages and styles, involving a high degree of superimposition. The oldest archeological layers at the site are still being investigated, and further finds of even older prehistoric art are possible. Arnhem Land has long been known as a rich area of Stone Age art, famous for the Aboriginal galleries of Ubirr rock painting at Kakadu National Park, and close to the ancient sites of Kimberley rock art in the northernmost region of Western Australia. It was in Kimberley where researchers recently dated one of the Bradshaw paintings (now known as Gwion art) to at least 15,500 BCE. Furthermore, the recent discovery of the very ancient Sulawesi Cave art (Indonesia) (37,900 BCE) suggests that Paleolithic sites in Kimberley may contain art that is equally old. Note: To put Nawarla Gabarnmang into context, the oldest art created by modern humans includes the Blombos Cave engravings (70,000 BCE) and the Diepkloof Eggshell Engravings (60,000 BCE) in South Africa, and the El Castillo Cave paintings (39,000 BCE) in Spain. For more, see: Prehistoric Art Timeline (from 2.5 million BCE). Although the Jawoyn Country rock shelter was well known among the contemporary Aborigine community as a beautifully decorated ceremonial site - senior Elders Wamud Namok and Jimmy Kalarriya recalled seeing the shelter's cave painting during their first visits back in about 1935 - it was rediscovered by scientists in 2006 during an aerial survey of the area, in connection with an archeological project in Arnhem Land called "Connecting Country". This collaborative project, requested by the Aboriginal Jawoyn Association, is led by Dr Bruno David of Monash University, and also involves Professor Barker and Dr Lamb (USQ), as well as leading French specialists including Professor of Archeology Jean-Michel Geneste (University of Bordeaux) and geomorphologist Professor Jean-Jacque Delannoy (University of Savoie). Once the shelter had been pinpointed, but before the archeologists began their excavation, Robert Gunn conducted an extensive examination of its parietal art, which includes rock engravings and some abstract signs as well as the wonderful multi-coloured figurative paintings. It was the archeological dig, however, that produced the big discovery. 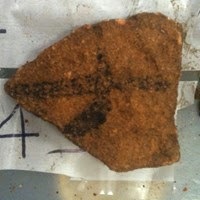 In October, 2011, at the USQ archaeology laboratory, while sorting and analyzing material excavated from a small square of the Nawarla Gabarnmang shelter, Professor Barker found a black drawing on the underside of a granite fragment which had fallen from the cave ceiling onto the floor. Lying in one of the archeological layers associated with very early human occupation, the drawing was made with charcoal, an organic material that could be dated directly. It was therefore sent for analysis to the radiocarbon laboratory of New Zealand's University of Waikato, where a specialist analysis team led by Dr Fiona Petchey took scrapings of the charcoal which yielded the date of 26,000 BCE, placing it amongst some of the oldest art in the world. For more, see also: Oldest Stone Age Art: Top 100 Works. There are a vast number of Aboriginal ancestral sites in the Jawoyn Country, many of which - like Nawarla Gabarnmang - are located in extremely remote areas. Thus, up to 2010, a total of 117 site complexes, containing some 921 sites with more than 44,000 artworks have been registered on the database of the Jawoyn Association. The Nawarla Gabarnmang shelter itself, traditionally owned by the Jawoyn clan Buyhmi, occupies a remote site east of Kakadu National Park. The cave is completely open to the north and south, and has about 1,500 square metres of living space. Its ceiling provides roughly two metres (6.5 feet) of head space, and is supported by some 36 sandstone pillars. The soft rock between the pillars has been eroded partly by natural weathering, and by human effort. The ceiling, walls and pillars are covered with a spectacular collage of Aboriginal mural paintings, with traditional images of barramundi, crocodiles, kangaroos, wallabies, human and spiritual figures from the "Dreaming" - a real Sistine Chapel of prehistoric art. NOTE: For the oldest examples of Aboriginal finger fluting in Australia, please see: Koonalda Cave Art (c.18,000 BCE). The floor of the shelter is covered with earth, a mixture of ash, silt, and broken rocks down to a depth of about 2 feet, which contains seven separate stratigraphic layers. Carbon dating tests show that human occupation in the cave dates from 43,000 BCE, slightly later than the occupation of other nearby sites Malakunanja II and Nauwalabila 1 (about 53,000 BCE), but some 5,000 years earlier than Carpenter's Gap Rock Shelter 1 (Kimberley, WA), Beginner's Luck Cave (Tasmania), Lake Mungo 3 (NSW) and Nurrabullgin Cave (Cape York Peninsula). The discovery of used chunks of hematite "crayons" recovered from Malakunanja II and Nauwalabila 1 raises the possibility that Gabarnmang shelter was decorated by its early human inhabitants, but in any event, the age of the charcoal drawing - along with other evidence - indicates that the ceiling of the cave must have been painted around 26,000 BCE, if not before. Among other ancient artifacts discovered in the cave was a piece of a ground-edge stone axe, dated to 33,000 BCE, predating the oldest known stone axe elsewhere by about 5,000 years. The Nawarla Gabarnmang cave art consists of a charcoal drawing made on a piece of rock, some 3 centimetres by 3 centimetres, that fell from the roof during prehistory. The drawing itself comprises 2 crossed lines: one is straight, while part of the other is slightly curved. The area formed by the curved part has been filled in with a heavier (thus darker) application of charcoal, but the rest of the drawing is faded beyond recognition. The stone fragment is aged between 28,000 and 45,600 years old, while the charcoal drawing is dated to 26,000 BCE. The drawing is broadly contemporaneous with the Fumane Cave paintings in Italy (c.35,000 BCE) and the Chauvet Cave paintings in France (c.30,000 BCE), both painted during the era of Aurignacian art in Europe. Note: Despite its advanced age, Gabarnmang's charcoal drawing is unlikely to be northern Australia's most ancient art. This honour is likely to go to the cupule art or hand stencils of the Kimberley region, which are believed to date to at least 30,000 possibly 40,000 BCE. Excavation of the shelter also disclosed a large part-used ochre "crayon" of mulberry colour pigment - amidst sediments dating to 13-23,000 BCE - that matched the colours used in the 'Mimi' or 'dynamic' human images drawn on the ceiling and walls of the cave. (See also: Prehistoric Colour Palette.) These 'dynamic' figures, a derivation of Kimberley Bradshaws, are a feature of Paleolithic art in the Arnhem Land area. Characterized by elongated limbs and a graceful body shape, they are typically decorated and adorned with headdresses, tassels or sashes, armlets, necklaces and feathers, and armed with barbed spears, boomerangs or axes. In the Kimberley region, the Bradshaws (now called Gwion figures) have been carbon-dated to at least 15,500 BCE, although they are believed to date as far back as 25,000-30,000 BCE. To compare Australian rock art with that of Africa, see the animal paintings on the Apollo 11 Cave Stones (c.25,500 BCE) in Namibia. The glorious murals of the Nawarla Gabarnmang cave are vivid testimony to the cultural heritage community, social cohesion, and spirituality of the early Aboriginal settlers of Australia, who managed to create enormous beauty in a hostile environment of blistering heat and parched land, some 23,000 years before the erection of the Egyptian Pyramids or the Stonehenge Stone Circle. Australia is blessed with a huge quantity of ancient art, ranging from granite petroglyphs to limestone pictographs and various forms of mobiliary art. Unfortunately, the sheer amount of Aboriginal rock art - see, for instance, the million or so engravings which constitute Burrup Peninsula rock art - makes it difficult to focus on the most ancient examples, while the fact that Aborigine artists have continued painting and repainting at their traditional sites for at least the last 4,000 years can cause difficulties for researchers and archeologists wishing to study and date the rich human heritage around the country. On top of this, rock art is notoriously difficult to date without the use of cutting edge techniques, because most of this art is created using inorganic paint pigments like ochres, which cannot be radiocarbon dated because they contain no carbon. Newer techniques, such as cosmic radiation or Uranium/Thorium dating are better able to solve some of these dating problems, although we are far from inventing a foolproof method.  For early prehistoric sculpture, see: Venus Figurines (40,000-10,000 BCE).  For other native arts and crafts, see: Tribal Art.  For more information about prehistoric drawings in Arnhem Land, see: Homepage.